Online registration has closed at this time, however walk-up registration is available today from 5:30 to 7:30 pm at Cowles Commons. There is plenty of room for additional participants tonight. Cash or check only, please. 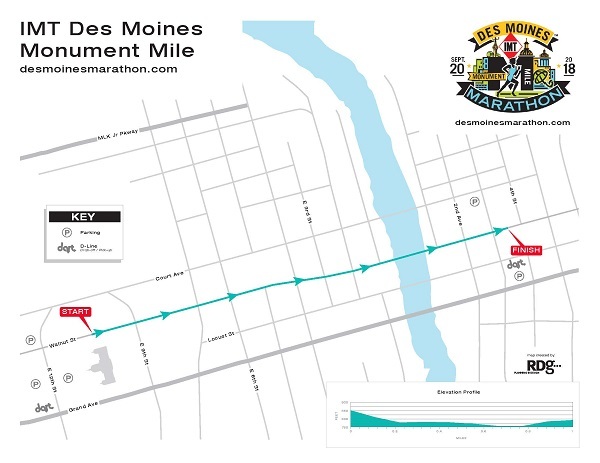 The IMT Des Moines Monument Mile features a 1-mile course on Walnut Street from the Iowa State Capitol to Cowles Commons. Designed for participants of all ages and abilities, entertainment both before and after the race will be offered at Cowles Commons by Final Mix on the Local 5 Stage. When this page loaded, the official time was 6:17:48 PM EDT.